Part of a mural outside of Richard's. A throwback to a bygone era; Stepping into Richard's is like stepping back in time. Hand carved meats and a limited supply of specialty items are for sale, but the homey atmosphere with wooden floors and generations-old fixtures make for a fabulous ambiance. Known as a popular spot to get boudin in Abbeville, Richard's cracklin are first rate as well. The cracklin are home-cut in plain sight. There are some exceptionally long pieces and the skin is a perfect blend of puffed skin with a crisp exterior that has started to bubble and pop from the hot grease. 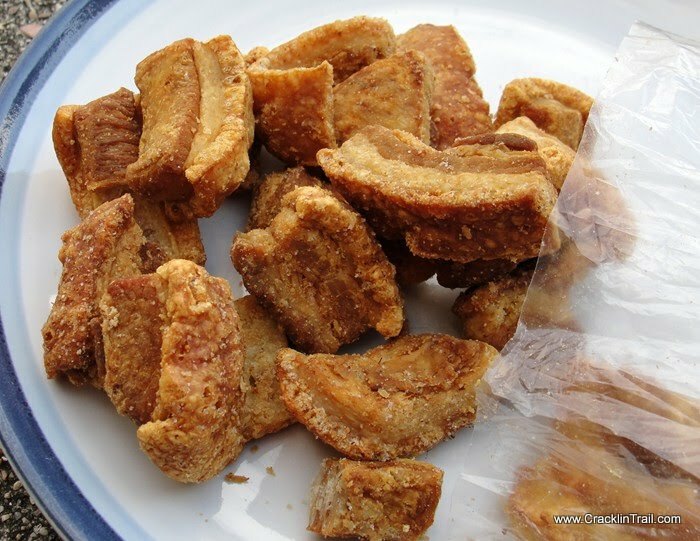 The seasoning on these cracklins is a bit bland and the meat, while plentiful, is overcooked. Even so, these are some darn satisfying cracklins in a great little city. Richard's cracklin are sold by the bag instead of by the pound. The skins on these have a think crispy exterior and a puffy underlining. To read a review of Richard's boudin click HERE. Best Baudion in Louisiana. I drive 675 miles to buy them!! !